Build Tight & Ventilate Right is the mantra of the Energy Savings Trust, so that's exactly what we offer. MVHR with airtight insulation. This bulb is at the latest in LED technology and design. Constructed in an aluminum alloy casing with heat sink profile. Capable of producing 240 lumens with a beam angle of 38 degrees. Available in either cool white or warm white making it a perfect soloution to any residential or commercial application. As the cost of living in the 21 century rises Solarcrest presents you with a 22 century solution to help reduce your energy consumption and reduce your impact on the environment.LED lighting technology has come a long way from its inception in the early 1900s. The choice to replace old inefficient incandescent bulbs with Low energy LED replacement bulbs has never been easier. LEDs produce more light per watt than incandescent bulbs and therefore require up to 80% less power to achieve the same light levels. LEDs light up instantly compared to low energy CFL bulbs. LEDs are ideal for use in applications that are subject to frequent on-off cycling. Solarcest has sourced a range of dimmable bulbs to suit your every need. In contrast to most light sources, LEDs radiate very little heat and run cool to the touch. There is also no UV or IR radiation that can cause damage to sensitive objects or fabrics. All Bri-Tek LED lamps will give you up to 40,000 hours of useful life and could last up to 100,000 hours before complete failure. For average use in a domestic household this can mean up to 10 years of use before they need replacing. LEDs fail by dimming over time, rather than the abrupt burn-out of traditional bulbs. LEDs, are extremely robust being solid state components, are difficult to damage with external shock, unlike fluorescent and incandescent bulbs which are fragile. 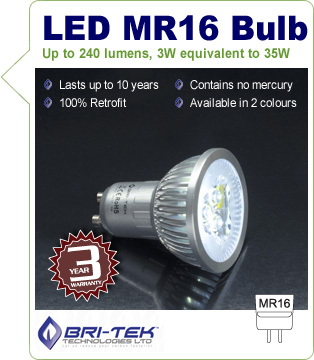 LEDs do not contain mercury which is a growing problem with most traditional lamps when it comes to end of life. Solarcrest strive to provide a variety of contemporary designs and cap fittings to give you the widest choice of replacement LED lamp to brighten up your home. What this means that not only do LEDs replace existing lamps they are beautiful to look at and enhance the feel and look of any enviroment. Company # 06964675 VAT # 974674958 Copyright	© 2015 Solarcrest.